In the United States, San Francisco is the second-most expensive city to live in. If a couple can’t get well above the six-figure salary, it can be very difficult to maintain reasonable living conditions. 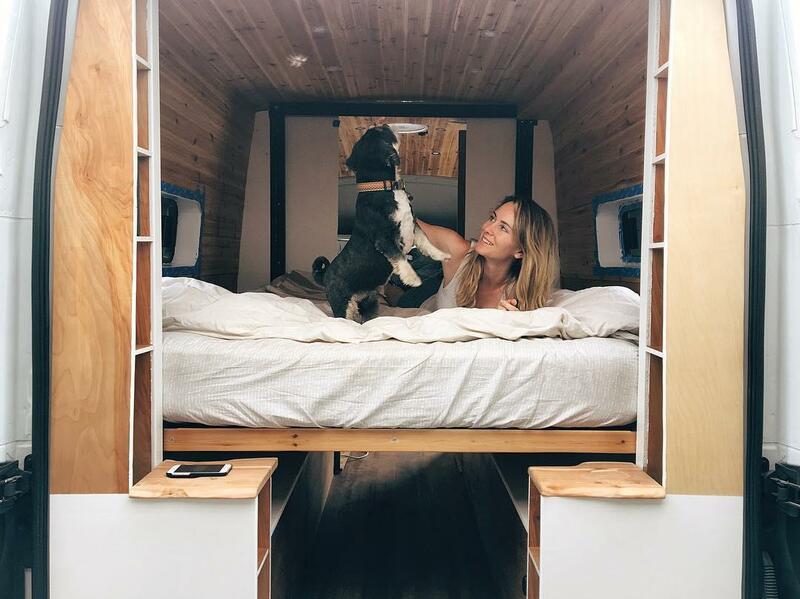 There’s a been a push for finding inventive ways to live in small spaces and the creation of tiny homes, and that’s exactly what two people did when they were fed up with high living expenses in the Bay Area’s metropolis. Richmond, Juliana, and their puppy, Roscoe, traded in their residency to live in a Sprinter Van. It only checks in at 50 square feet, but they made the most out of the space. Perhaps the largest issue the couple faced was storing their outdoor equipment as they loved to camp, hike, climb, surf, and more. They were able to succeed by limiting their clothing options, creating convertible spaces, and finding multiple uses out of the same items. While it helps that Richmond and Juliana liked to be outdoors, they were able to keep clutter to a minimum inside the van. More advice they provided on their blog was disciplining themselves to stay organized. They would have bins for specific activities, like making coffee or cooking. It also helped to keep space available for items they’d obtain in the future. One unique aspect the Sprinter Van home has is the bed lift. While some tiny homes have a place where the bed can hide away, traditional methods wouldn’t work for such a small area. Instead, they opted for a lift that pushed the mechanical bed up to the roof, giving them space for a living room. For power, the couple relied on solar energy. They installed 200 watts of solar panels on top of the van and added a large battery back. If there isn’t enough sun, another option is getting power from the alternator. They obviously needed a kitchen to cook from, and they didn’t skimp on that aspect either. Since the van could generate plenty of electricity, they were able to install a portable Engel fridge, which looks like a souped-up cooler. They had a normal sink that was ran on an electric pump and added plenty of counter space that included a portable stove. Back to cooking in the van after a week+ of having a real kitchen!! It was nice to have a break and be able to spread out, but now feels totally normal to be back on the camp stove. Though lately I've started to grow nostalgic for a more sedentary and routine lifestyle, for a location to settle and start something bigger, I can't deny how much this feels like home. 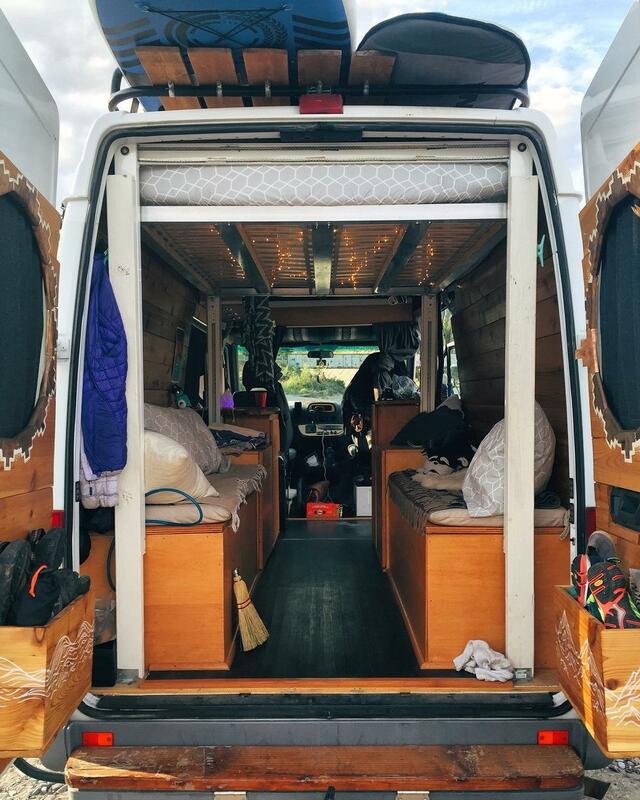 The couple have been living in the van for over a year and have detailed their experience on their blog and on Instagram. Instead of going to their daily jobs, they’ve spent time traveling and exploring many areas from Mexico to British Columbia. While photos make their adventure look incredible, they’ve also noted some of their struggles adapting to their new home. Some examples include tough weather situations, dealing with bad smells, and having to live in such a small environment together at all times. Along with keeping people updated on their journey, Richmond and Juliana created a 130-page book that outlined how they converted the van into a living space and what essentials are needed to succeed. The couple are also ready to sell their Sprinter Van to focus on another project. It has over 215,000 miles on it, but the sales page notes that “Sprinters are known to go for 500k+ miles.” All major repairs needed have been done and one of the only lingering issues are body rust, which is natural.